Select the design(s) you are interested in from one of our Collections. Please contact us via phone or email and we will walk you through the ordering process and answer any questions you may have. If you are in the Chicago area, we can also set-up a meeting in person. During our first exchange we will discuss the design(s) you are interested in, the quantity you want to order, as well as paper and ink colors. We will also discuss what elements you would like to include in your invitation suite. 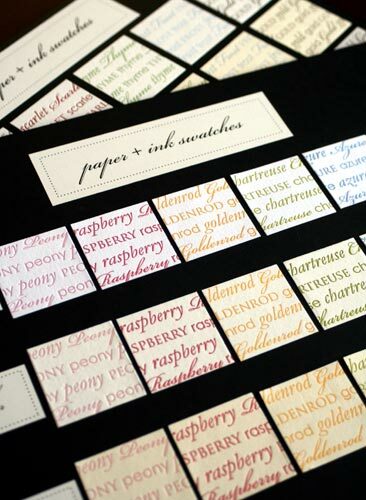 Save-the-Date cards may be ordered several months before the actual wedding invitation suite. We recommend you think about a few basic order specifications before our first exchange. Click here for a PDF outlining wedding order details and timeline. If you are interested in a Custom Design, please contact us to set-up a meeting or conference call. Based on our conversation and your project requirements, we will send you a quote for your order via email within 2 business days. Please be advised that if your order will be picked up or shipped to an Illinois address we are required to charge the applicable Cook County, IL sales tax. Orders shipped out of the state of Illinois are not subject to sales tax. Once your quote and project details have been agreed upon, we will send you a contract via email. The contract will encompass the specifications for each piece ordered, the total cost of the order and the proposed date of delivery. We require your signed contract and 50% deposit before we begin the design phase. You will also need to supply us with the final text for each printed piece at this time. Once we have your final text for your printed piece(s), we will send you a PDF proof within 3-5 business days. One proof round is included in your order. You will be able to make corrections/changes to the first proof(s) sent. Your proof will be updated with those corrections/changes and a second proof will be sent. This second proof should be absolutely perfect and ready for sign-off. If you decide that you would like to see additional fonts or colors or design options, a proof fee of $25 for each printed piece will be incurred. If you need additional proofs beyond those in your one proof round, a proof fee of $25 for each printed piece will be incurred. We require a signed and approved proof of each printed piece before we will send your order into production. Signed proofs can be mailed, faxed or scanned and emailed. Printing will be completed within 4-6 weeks of proof approval. Once your order is completed, we will contact you and arrange the order pick-up or shipping details and final payment. Our standard methods of domestic shipping are FedEx and UPS Ground. We will do our best to accommodate client shipping preferences. Expedited and international shipping is available upon request. Rush orders can be accommodated depending on press time availability. Please inquire about rush order scheduling. A rush fee of an additional 50% of the order total will be applied to the order. Any expedited shipping required for any materials will also be applied.